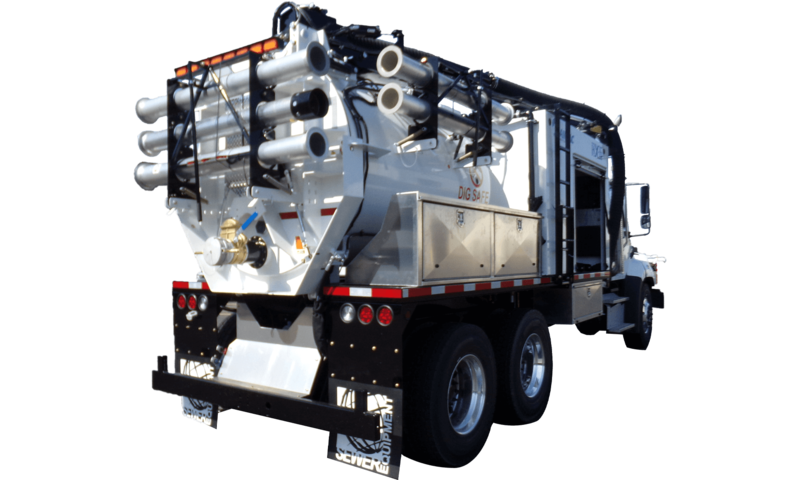 The industry’s first mid-size hydro excavation truck, this RAMVAC offers increased capacity with large productivity features. These single axle configuration units offer 6 cubic yard debris bodies, a boom reach of 13 to 18 feet with a 320 degree working radius. The 6″ vacuum system for these units feature a 3000CFM and 8″ blower capacity, as well as cyclone separation, a vacuum enhancer, directional discharge, hydrostatic blower drives, and a 10 micron final filter. For the water system, the HX-6 features a 650 gallon water capacity, a 10GPM @ 2500PSI pump, 400,000BTU water heater, all in a 80,000BTU heated enclosure. 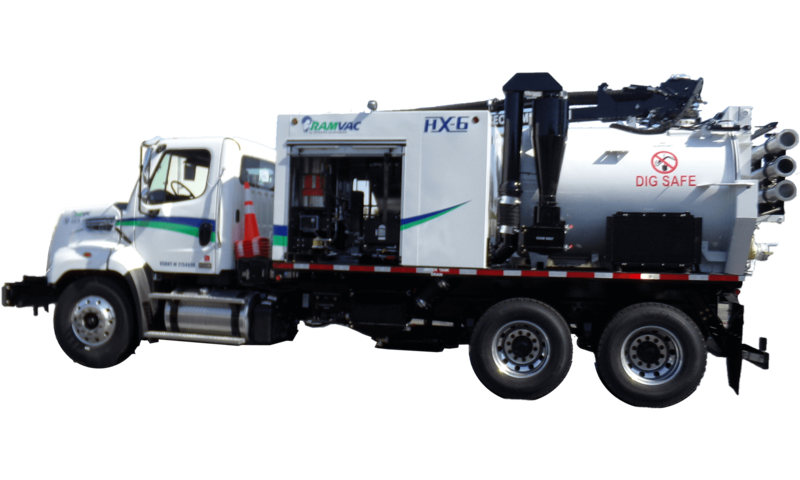 The HX-6 also boasts compact footprints, NEMA rated electrical systems, debris blow-off systems and fully hydraulic power trains for superior reliability. For customers looking to dig with air, you have the option to add a 185CFM @ 150PSI air compressor to your hydro excavation truck unit. All these features combined with a parts and service network that is available 24/7 makes it clear why RAMVAC is the best value for your equipment needs today! To see the RAMVAC in action, click here. 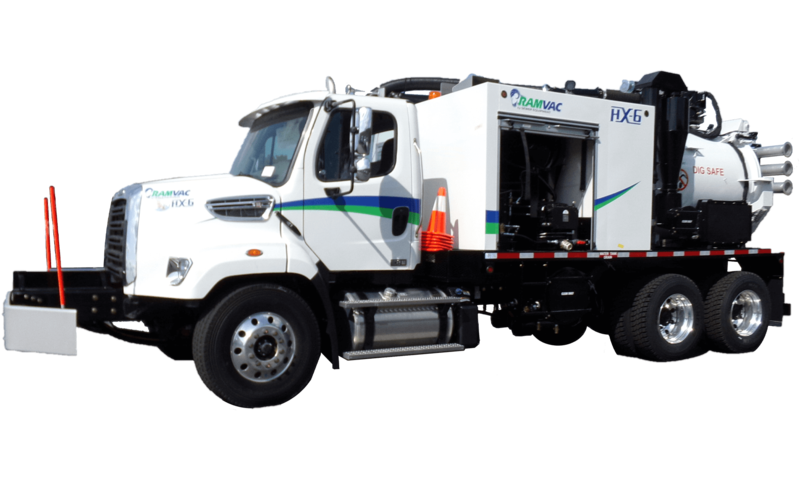 The RAMVAC HX-3 is the smallest model in the RAMVAC family of hydro excavation trucks, but is equipped with large productivity features. These single axle configuration units offer 3 cubic yard debris bodies, and a boom reach of 11 to 16 feet with a 320 degree working radius. The 6″ vacuum system for these units feature a 3000CFM and 8″ blower capacity, as well as cyclone separation, a vacuum enhancer, directional discharge, hydrostatic blower drives, and a 10 micron final filter. For the water system, the HX-3 features a 325 gallon water capacity, a 10GPM @ 2500PSI pump, a 400,000BTU water heater, all in a 80,000BTU heated enclosure. The HX-3 also boasts compact footprints, NEMA rated electrical systems, debris blow-off systems and fully hydraulic power trains for superior reliability. For customers looking to dig with air, you have the option to add a 185CFM @ 150PSI air compressor to your hydro excavation truck unit. All these features combined with a parts and service network that is available 24/7 makes it clear why RAMVAC is the best value for your equipment needs today! To see the RAMVAC in action, click here.